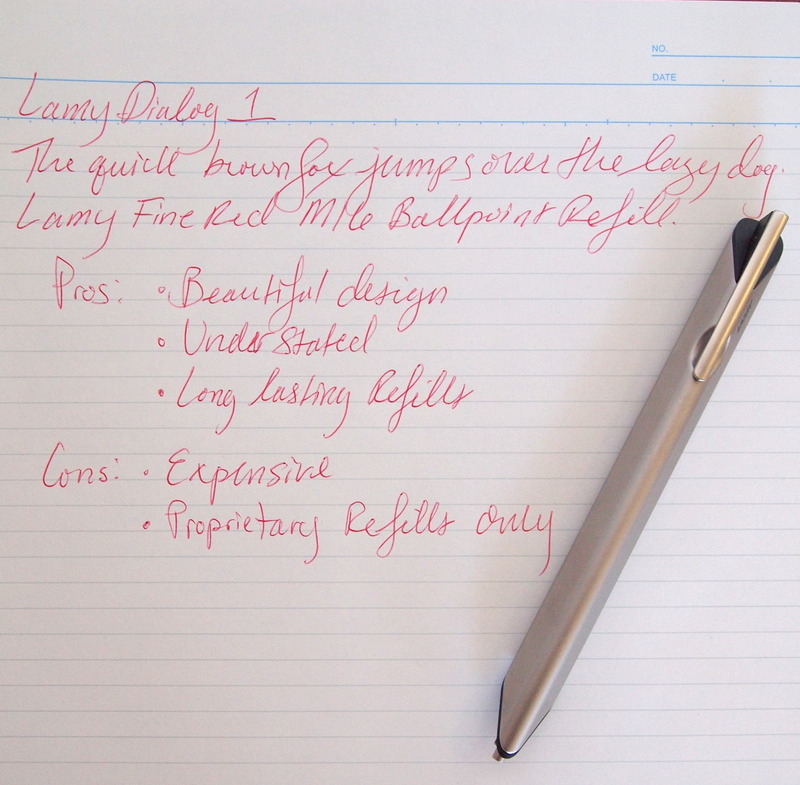 Lamy’s Dialog line features high end pens designed by prominent industrial designers. The Dialog 1 was designed by Richard Sapper, most famous for the Tizio Lamp by Artemide and the original IBM Thinkpad. The Dialog 1 features a metal triangular shaped body with a matte titanium finish. The pen weighs about 24 grams, which is pretty lightweight for a metal pen. The triangular shape of the body is comfortable to use. The bottom side of the pen is lightly rounded and has two little plastic feet to steady the pen on a flat surface. The Dialog 1 uses a push click mechanism and has a spring-loaded metal clip. 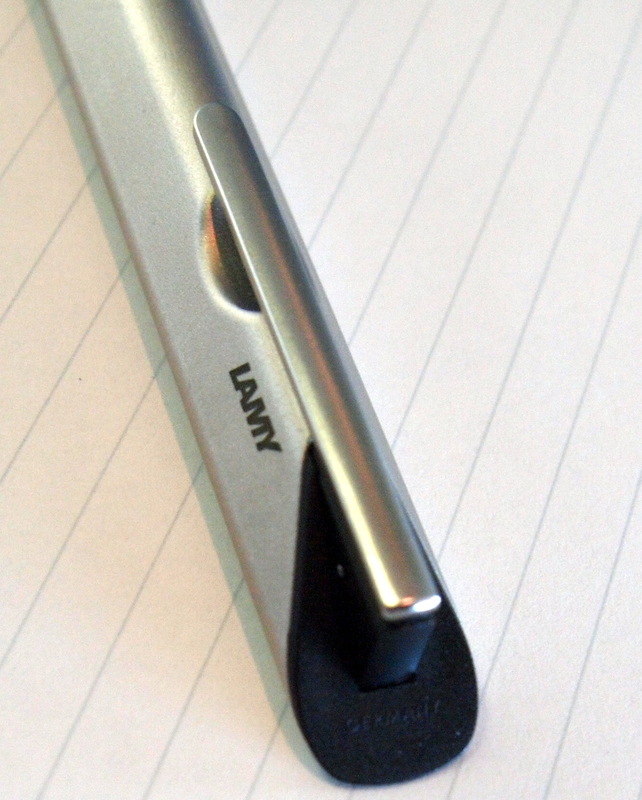 Underneath the clip is the Lamy logo etched into the body. The Dialog 1 only takes propriety Lamy M16 refills that come in black, blue, red with a fine, medium, or broad tip. They write well for a standard ballpoint and last a very long time. The ink is archival and states “for documents ISO 12757-2 HM DOC” on the body of the refill. The sample above is written with a red fine tip M16 refill. 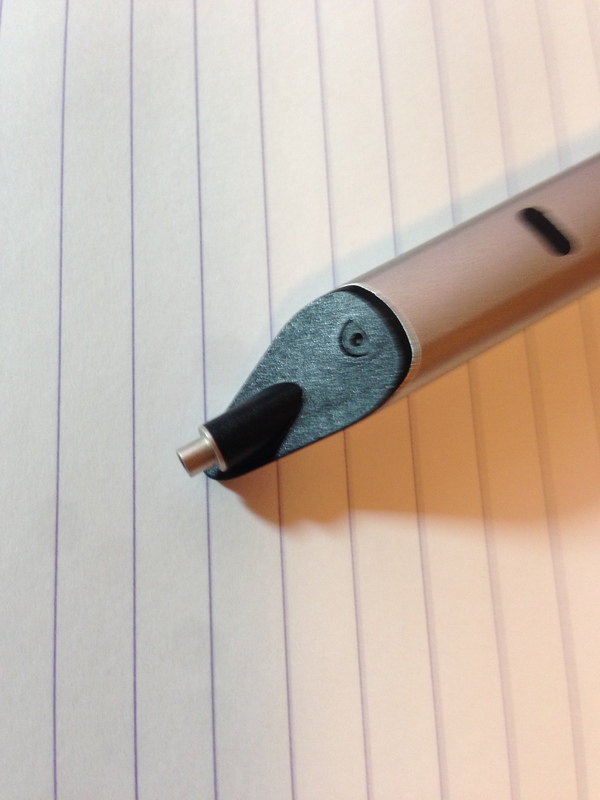 To change a refill you have to use the non-writing end of an M16 refill to poke the small dot on the black plastic portion near the tip of the pen; this releases the front section of the pen so that you may load the new refill. It is an interesting way to change a refill but necessary to keep the lines of the pen ultra clean. Also worth noting is that the matte titanium finish does attract fingerprints; I usually don’t like metal pens for this reason but the matte finish makes it more bearable. The Dialog 1 retails for $130, that is a pretty big investment for a pen that uses a $5 refill. I bought the Dialog 1 because I love the beautiful utilitarian design and wanted a nice pen to travel with. The Dialog 1 is a real conversation starter without being flashy or over the top; I highly recommend it.